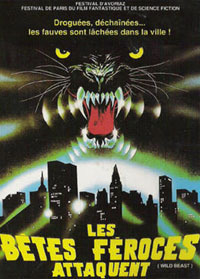 The Wild Beasts may in fact be one of the last of the eco-horrors made (only Rene Cardona’s Beaks aka Birds of Prey comes of more recent vintage), but it is very possibly the most entertaining of the batch. Leaving higher minded social concerns aside, it borrows the plot without the purpose, resulting in a sugary junk food confection that has little or no value in terms of edification, but sure does taste good, don’t it? Haughty cult cinema standby Lorraine De Selle (Cannibal Ferox, House at the Edge of the Park) appears, and while we’re told that she’s ostensibly some sort of a doctor or researcher, she spends 99% of the running time as a hanger on and/or fretting over her obnoxious brat of a daughter. I think we’re supposed to sympathize with the plight of a working single mother and her latchkey daughter’s desperately shrill cries for attention, but the end result is flat and at best humorous. Keep an eye out for that stupid frog puppet that quacks into the phone, which de Selle later steps on (resulting in yet another loud and grating quack) and then carries around for 10 minutes, before abandoning it forever – to hell with my daughter and her toys! Yep, it’s that kind of a movie. 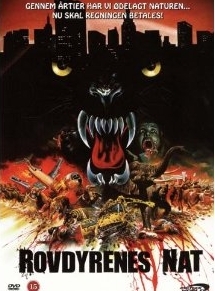 Set for some unknown reason in Frankfurt, Germany, what sets The Wild Beasts apart from its ostensible eco-horror kin is twofold – first, it’s set in its entirety in a cold and sterile modern cityscape, the whole of the action during the course of one evening. With its nigh-abandoned streets, the city becomes a character in and of itself, and makes the one attempt at metaphor Prosperi is able or willing to deliver, with the drab precision terraforming of man set against the rebellion of the natural and vibrant – and it’s perfectly obvious who loses in that equation. The second thing that sets the film apart is in that beyond the very point I just made, and unlike just about any ecological horror film ever created during the heyday of the genre, there is no point. In other words, it’s not industrial runoff. It’s not manmade pollution. It’s not even nuclear tampering or waste. You know what sets the animals off? Get this: drugs. Yes, in the first scenes of the film, we’re shown a subway escalator where quite improbably, a collection of used needles is piled up next to the handrail. If that didn’t already have you scratching your head in bewilderment at the delusional nature of the screenwriting here, somehow (and it’s never even hinted at how) the water supply has been inundated with a high concentration of Angel Dust. Seriously, PCP is the culprit here. Go figure. So the animals go nuts, and let the terrorization of the (rather sparse) citizenry commence: the zoo’s night watchmen, a couple making out in their car (right out in the open on a random street corner, mind you! ), and eventually (and quite conveniently) De Selle’s daughter’s dance class. 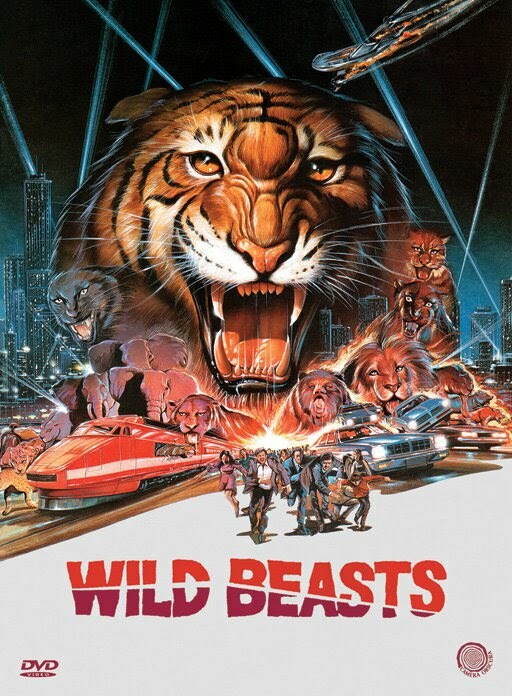 There are some frankly hilarious scenes, like the fast moving elephants who plunge the city into an impromptu blackout, the polar bear attack (doubled by a trophy rug and a stuffed animal arm at various points) or the cheetah who races a hysterical girl in an open roofed VW bug, causing all manner of amusing mayhem. But the best part is the final scene, wherein we discover that the animals weren’t the only ones drinking the tainted water…and it shifts gears into a killer kids movie in the final reel! While I understand there was a somewhat improved release from German label Camera Obscura, their self-imposed restrictions (making all releases “limiited release”, only selling through a handful of sites, asking a high starting price, and shipping from overseas) led me to go for the more reasonable route and get the Swedish Another World release (which I found more or less comparable, based on my Camera Obscura label DVD of Paganini Horror, and easily half the expense). The print was a bit darker than I’d like, and there were no extras, but it was a perfectly acceptable alternative until and unless a reasonable reseller comes along. Overall, I’d give The Wild Beasts a strong recommendation.